I have a nursery cherry tree that is about 7 feet tall. What will happen to the tree in the spring, if I cut it down to about a foot? I am thinking of doing the cutting in January or February went the tree is dormant. In the spring will the tree send up its sap and start budding on the trunk or will it give up the ghost? Not positive, but I believe the time to cut it back should be just before bud break. I have continually had bad luck trunk chopping cherries, It can take a couple months for the tree to seal the trunk wound THEN start the process of budding out. I think it's best to do this sort of reduction on cherries just as you see the buds swelling or just beginning to break (which is what I would do differently if I did it again) This would allow more sap reserve in the roots to swell new buds along the trunk for branches.I would hesitate to do it during dormancy I have found the tree needs to be "awake" to seal the trunk wound. I have found them very reluctant to swell dormant buds if you wait to long after bud break. You MUST seal the trunk wound or the tree will bleed sap, and usually have a serious die back. I've done a lot of trunk reductions and cherry always performed the worst with regards to healing the wound then producing new branches. Luckily yours is a nursery tree and already in a container, if you had to chop-then lift the tree from the ground it gets even more tricky. I did a reduction on a choke cherry last year and JUST managed to nurse it through its first year in a container this year, The Black Cherry I reduced this spring took till late july to heal its trunk chop wound and then produced new branches but even these were weak and disease prone, I'll be lucky if I can lift the tree next spring and get it to just survive its first year out of the ground. I wouldn't do a trunk chop Cherry again as so far my experience with them is poor. I would love someone who has more experience with them to give us BOTH some tips with regards to this species and doing this sort of drastic work. 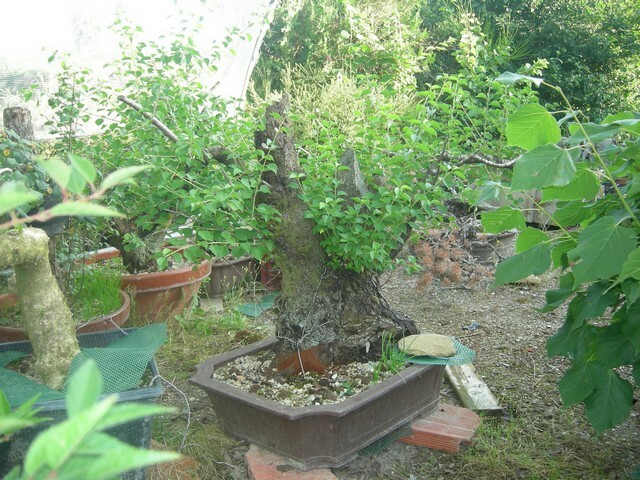 Cheries are not a good species for growing in pots, prunus mahaleb ( cerisier de st lucie in french ) are better, very easy to transplant in pot and to live in pots, beautiful trunks and dead wood, with small fruits. They also accepet to be grafted with others varieties like KOJO NO MAI for exemple . The Cherry I have is a 'Kwanzan' Prunus serrulata. In order to reduce the size would in be better to prune the top branches to encourage growth lower in the trunk. As I get growth lower in the trunk I could reduce the trunk a little at a time. Could I reduce the this way in the growing season? How many of these trees you've listed are grafted? Look for the 'tell tale' bulge of a graft union. It is preferable to reduce in winter. All described species are slow-growing species, the same technique: to reduce in winter . here is the article I reffer to when I do trunk chops I have found it to be useful year after year. i have done something similar this year but rather than chop i started an air layer at the point i wanted to chop. this has kept the entire tree alive and many buds have broken below the moss ball. Roots have also formed and the top may survive, giving me 2 trees !, if it doesnt it makes no difference as i only really wanted the lower bit, which now has about 15-18 swelling buds and new small 1" branches to choose from. The only grafted tree on my list is the Japanese Ever Red Maple. I realize I wrote the names in the incorrect format. I got the trees at nursery for a big discount. The Japanese Red Maple is grafted to regular green Japanese Maple. The graft is about a foot from the roots and the root stock part of maple is grow strong. I am thinking of air layering tree just below graft. That would allow me to have a new tree with the graft low on the trunk. I really like the idea of air layering the cherry. Thanks! jimwall wrote: The only grafted tree on my list is the Japanese Ever Red Maple. I realize I wrote the names in the incorrect format. I got the trees at nursery for a big discount. The Japanese Red Maple is grafted to regular green Japanese Maple. The graft is about a foot from the roots and the root stock part of maple is grow strong. I am thinking of air layering tree just below graft. That would allow me to have a new tree with the graft low on the trunk. If the top part of the Ever Red is growing strong next year, it would be common practice to layer above the graft thus removing it altogether and getting the ever red onto its OWN roots. The problem with grafted trees as you have discovered is that often times the graft root stock will begin to grow and or out grow the top. I saw this last week on a Japanese maple at a nursery, It had two different sets of foliage, a Palmate from the root stock and a Dissectum from the top. If all of your trees are Nursery bought I would be surprised (especially with the fruit trees) that they are all on their own roots and not grafted unions. Look closely, dig a bit in the soil.